this looks like the perfect dinner to me! And with the addition of that shaved truffle – OMG heaven!!! this looks absolutely FANTASTIC. I can’t believe that truffle was only 3 bucks. Wanna ship me some? p.s.- your pictures are gorgeous. 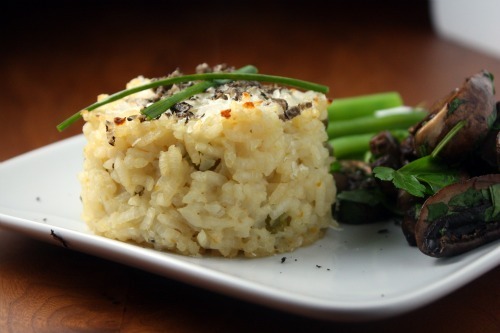 I especially love the side view of the risotto cake! I am with you on the food blog weirdness! I had a group over for the football game yesterday and did a build your own chili bowl set up with many, many options. Everyone’s bowl was very different from the next, so of course I was going around taking pictures of people’s bowls when they were trying to eat. Talk about a weirdo. I am glad you posted this, it gives me all sorts of ideas. Mouth-watering photos! $3. for a truffle? So cheap, never heard of that! I could totally see myself making a whole batch of risotto, not eating any of it the first day, and then saving it to make a full batch of these the next day. With plenty of leftovers. I wish I could find Meyer lemons around here! Oy. And yeah food blogging is totally weird. But it’s also probably one of the best things that ever happened to me. So I accept it. I’m weird. 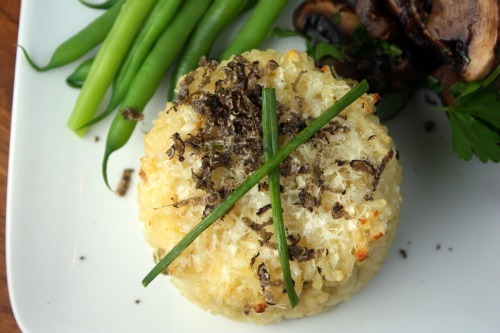 Risotto cakes sound so good. I have made them informally, but not like this. I must remember to try this soon! 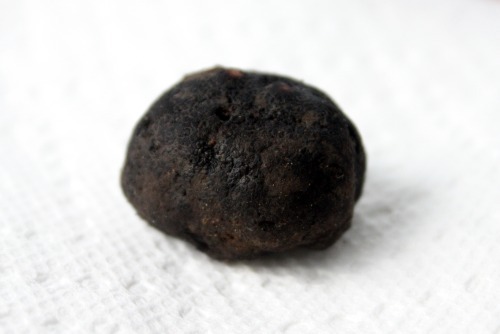 Fantastic post and check out your truffle for $3! I don’t think anyone is getting over that. Great photos. I had to laugh about the food blog wierdness – my brother-in-law was scrolling through my camera photos the other night and came across some food ones – “you take pictures of your potatoes” he cried. His sister responded for me – “it’s for her blog”. Glad I’m not the only wierdo out here. 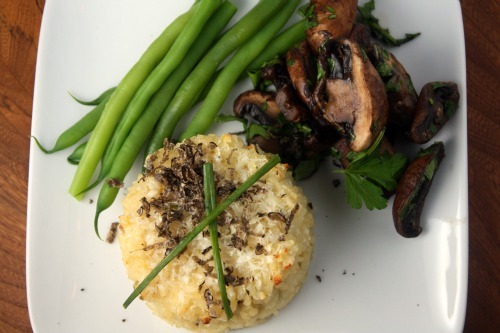 And these risotto cakes – yum! I love the picture you took of the truffle- it’s gorgeous! your pictures are just gorgeous!! i really love how pretty this dish is. I’m always impressed when somebody does something fabulous with leftovers. That truffle! I didn’t realise you had local truffles. I’ve heard that they cultivate truffles in Tasmania, but unfortunately I haven’t had the pleasure of having one yet. Wow! Nice truffle, I didn’t realize you could buy WA truffles for only $3! And what a great way to use Meyer lemons. I buy them by the boat load from Costco and am always looking for ideas. haha. i totally know what you mean about not measuring, not having a great recipe to write about, but then something’s so good you want to share it! also, truffle? yum! i honestly haven’t seen them at a market yet, but i’ll keep a better eye out now, especially if I can score one for $3! !